Samsung is one of the few mobile phone manufacturers that is known to put out numerous handsets in a short amount of time which can almost overwhelm some people out there to figure out which device to go with. They're at it again with their old ways as T-Mobile will become the next stop for their blitzkrieg tactic. We've been hearing about the successor to the Samsung Gravity 2 for quite some time, but now it looks pretty clear that the Samsung Gravity 3 is just about ready to make its debut. For those who've been faithful to the series, the latest model shouldn't disappoint anyone seeing that it features a 2-megapixel camera, HSDPA 3.6 support, and will be available in either Indigo or Rum colors. 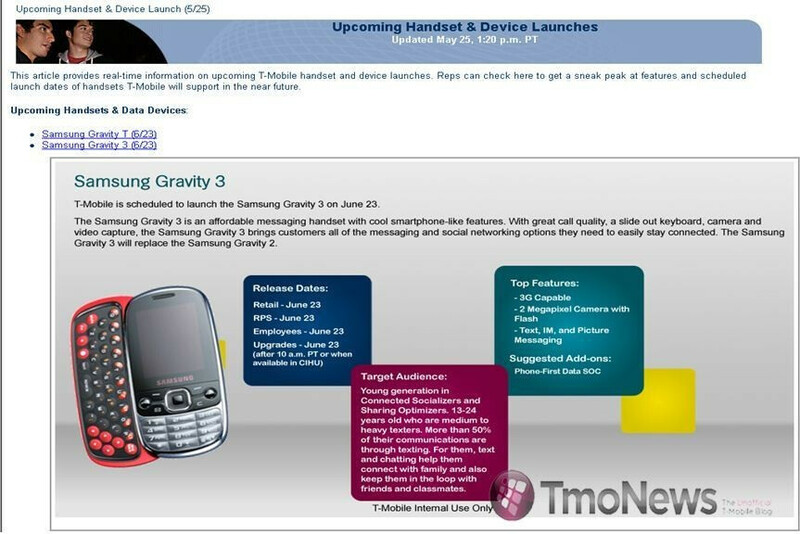 If you're looking for a basic text messaging device, then the Samsung Gravity 3 should prove to be a decent solution without breaking the bank. Moving on up slightly above the Samsung Gravity 3 will be the Samsung :) which is interesting due to the fact that doesn't necessarily stick with a model name – instead it opts for the “smile” symbol text messengers are all too familiar with. 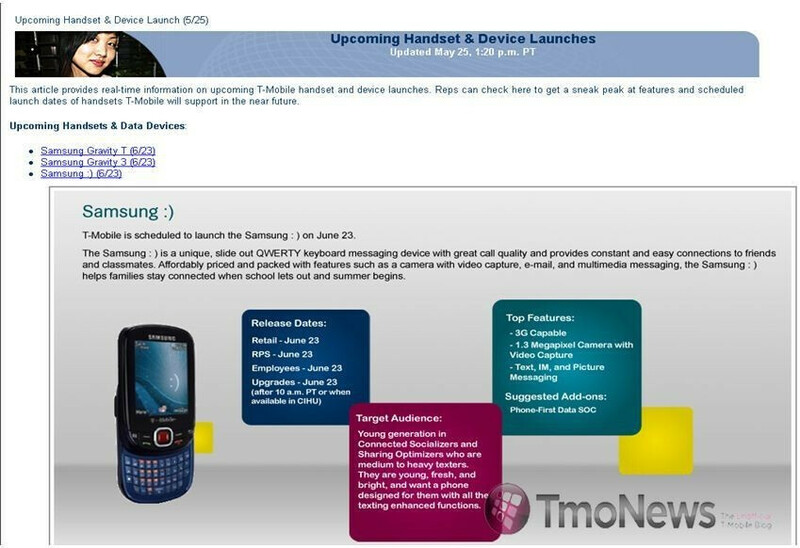 The Samsung :) is also being positioned as an entry-level messaging device that features a 1.3-megapixel camera, full HTML web browser, support for active sync exchange mail, and available in three color flavors for your choosing. The portrait slider phone follows some of Samsung's other devices in terms of design like the Samsung Reclaim for Sprint. 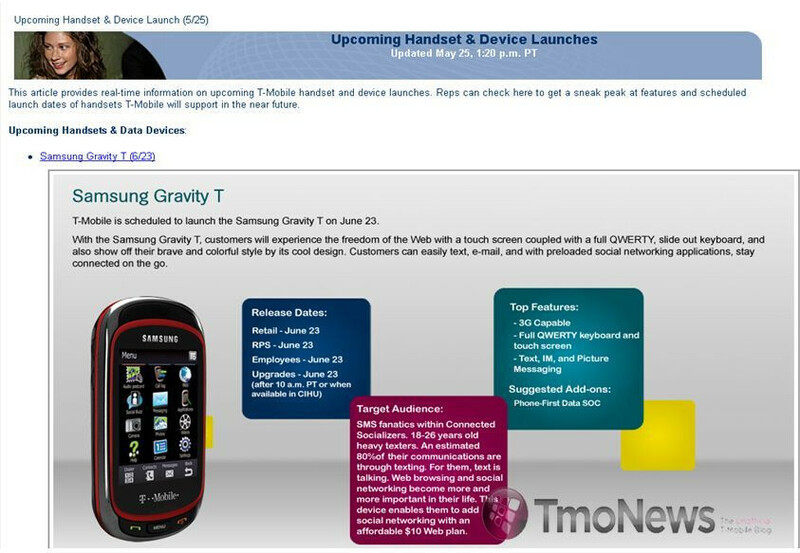 Last up on the chopping block is probably the highest-end non-smartphone device bound for T-Mobile – the Samsung Gravity T which should be more than your basic handset, but still not as in-depth as some smartphones. This device features a resistive touchscreen, full QWERTY keyboard, Dolphin web browser, and a 2-megapixel camera. In addition, it sports an “optimized” version of Samsung's staple TouchWiz user interface that'll be accompanied with plenty of widget love all around. All three of these handsets are pegged for a June 23rd launch – which should probably be regarded as Samsung launch day for T-Mobile. Now that we know just a little bit more about these handsets, the only thing left to figure out is pricing – which is something that's still unknown. good job Tmobile. Thats a nice line up of regular phones that will appeal to all sorts of people. Exactly, there is a huge market for these types of phones. I work around kids and the messaging-centic type phones are what they use and want! And they like the ones with the keyboards, cause all they do is text! The techies and high-brows may scoff at them, but they sell like .25 cent cheeseburgers. If it weren't for these type of phones that sell so well, the prices of the advanced phones even subsidized might be higher. They are bread & butter for the carriers.